Freiston, Leake and Leverton’s unbeaten run came to a juddering halt away at title-chasing Spalding. The hosts amassed 241 from their 45 overs before Freiston could only manage 106 in this SLBL Premier match. After winning the toss and electing to bowl, Freiston started poorly. Freiston did manage to regain an element of control through good bowling from Abdul Moeed and Zeeshan Hassan, but the damage was already done. Both Spalding openers reached deserved half centuries, before Nel (63) was well caught in the deep by Taimur Mian off Moeed’s off spin. Fellow opener Manton made 64 before being caught behind off the bowling of Hassan. Spalding captain Newton then increased the tempo with an aggressive 68. Freiston did stick well to their task and, did well to restrict the hosts to 241. Taimur Mian bowled Newton for 68 as he and Hassan bowled well at the death. However, Spalding still posted a very strong total. In reply, Freiston were unable to get off to a quick start, despite a good innings from Tom Appleyard. Accurate bowling by the hosts managed to tie down the Freiston batsmen. Experience Tilley accounted for Freiston’s top four, including Appleyard for a well made 34. Wickets then continued to tumble at regular intervals. 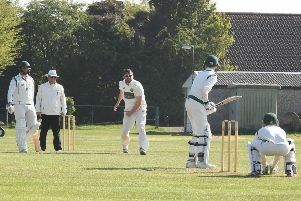 Left arm bowler Miles picked up four wickets as Freiston’s lower order had no answer to the accurate Spalding bowling. Zeeshan Hassan (12) saw Freiston past the hundred mark but the returning Andrews accounted for the final two wickets, as Freiston were all out for just 106. Freiston travel to table topping Skegness on Saturday, looking to put in a much-improved batting performance.